Oh boy! I was eagerly waiting for this feature in WebUI for so long. SAP strongly recommends to use WebUI over eclipse. Since we are quite comfortable with the features of eclipse, it takes time to adapt WebUI. Nevertheless SAP CPI/HCI as a product is evolving over time and trying to provide all the features that were available in SXMB_MONI of SAP PI/PO and trace features of eclipse. I was really to glad to see the Trace features now are available in the WebUI. 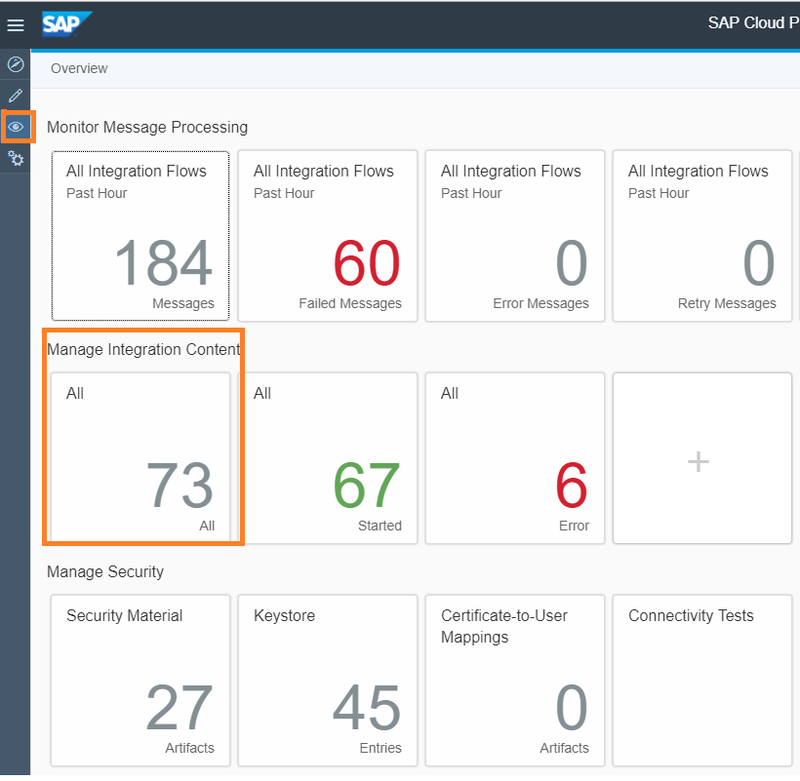 To enable traces in eclipse you can check https://blogs.sap.com/2014/11/28/blog-1-tracing-capability-in-sap-hana-cloud-integration-hci-pi/ by Sujit Hemachandran. I’ll take a small tour on how you can enable the logs and view the traces in webUI. I believe the audience has basic knowledge of creating an IFlow and deploying it in webUI. Once the IFlow is developed and deployed in Web UI successfully, go to Operation View->Manage Integration Content and click on the IFlow, which you want to enable the traces. Click on the Log Configuration, in log level drop down select the Trace. Note: When an IFlow is deployed, by default the log level is set to info, wherein it displays only few parameters of the IFlow, like IFlow status, message ID, etc. It doesn’t display the step wise logs. In my opinion it’s better to set the log level to debug mode. Since traces are available only for 10 minutes, it will be quite helpful to look at debug logs even at later point of time. Once done with the above settings, on the next run onward the traces will be logged for an hour. Step 2: Once you click on the Trace, you will be directed to a new screen with the logs on Top and IFlow at the bottom (You have an option to zoom in and zoom out the IFlow). The logs are placed in a stack, meaning the traces start from bottom and end at the top. The traces and debug show time taken at each pallet, activity, branch ID and actions. Step 3: If you want to find Model Step ID of a pallet/adapter then, just click on the pallet/adapter that you are interested in and you can see a small icon “i”, click on it to find the ID of the pallet/adapter. Else you can directly click on the Model Step ID present on the Log table, the corresponding pallet will be highlighted with orange color border (sometimes it blinks too). Step 4: Click on the corresponding action button for the Model Step Id, which you are interested in. You will be directed to a different screen, wherein you can see the properties and configuration of that pallet and the content of the message at that pallet. (The screen will in display mode, so you can’t edit the properties here). Go ahead and try this feature and let us know your feedback. 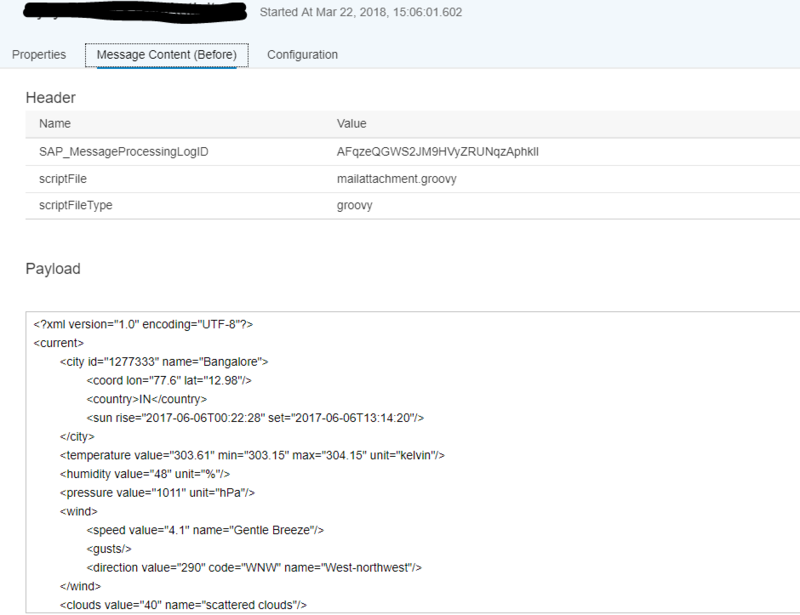 Please check out this comprehensive blog https://blogs.sap.com/2018/03/13/troubleshooting-message-processing-in-the-cpi-web-application/ for troubleshooting messages in CPI web UI. So, at this moment WebUI = Eclipse in features? Yes, looks so and it might get advanced than Eclipse. For sure your blog contains more details. One feature should be enabled in WebUI to click on the envelope in the I-flow to check the payload as there in the Eclipse. It would be very easy to debug !! I have set the log level to “Trace” and executed integration flow. Post execution, in message monitoring I could see the integration flow is executed successfully and it is decorated with envelope with all run steps details similar to your screen shot. But when I click on any “Actions” of any step, I could see only 2 tabs i.e. “Log” and “Configuration”. Other tab-“Message Content(Before)” is missing to see the payload of any step. I have tried this on multiple Integration flows and multiple CPI tenants, but still couldn’t see “Message Content(Before)” option under “Actions”. Can you please let me know if there are any additional roles required for the S-user to see this option? or Is it visible only for Enterprise Edition access? Please clarify.